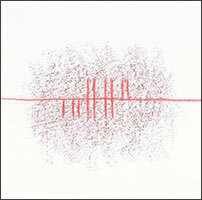 Twenty-one new poems by distinguished poet Dinah Hawken together with eight drawings from stone rubbings in crayons and pencils byleading sculptor John Edgar. 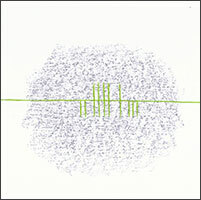 Poet and artist have worked closely together for several years to produce this profound and moving book. Dinah Hawken writes: For many years I have been instinctively attracted to the word ‘stone’ and equally attracted to stone and stones. So it has been fulfilling to work with John on this crafted book. It amazes me that a thing as dense, plain, and as taken-for-granted as a stone can give rise to so many human ideas and associations. In that respect a stone is far from inanimate. It is a catalyst, like a page. 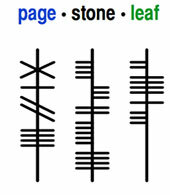 The poems in page : stone : leaf carry some of my associations with stone, along with a very short history of the page and its inseparable links with leaf and stone. John Edgar writes: As a sculptor I have always been fascinated by written language, especially ancient symbols and inscriptions on stone, clay and paper. I have studied stele and standing stones, grave stones, church floors and temple walls, and more recently modern digital code. 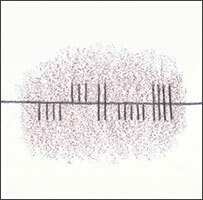 After much thought on my drawings for this project, I returned to the language known as ogham; an ancient text of celtic origin which was inscribed in simple lines on stone or wood. 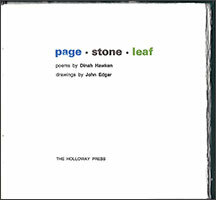 page : stone : leaf is designed and letterpress printed by Tara McLeod on a Littlejohn cylinder press. The type is 12pt Helvetica linotype set by Longley Printing Co. Ltd. Images printed by GTO printers. Binding is by Design Bind Ltd. The paper is 290gsm Tiepolo, mould made in Italy. Hardbound, 21 x 22 cms. 42 pages. 55 copies. Price until 10 March 2014, $280; from March 11, 2014, $350.